Bridget Dempsey was born in Ireland in 1835/36. She died in January 1899. Bridget married Nicholas Laux on January 16, 1860 in Macon County, Illinois. Peter Laux (b. 1812 d. 1859) married Margaret ?? (b. 1811, d. July 1859). Family arrived in America in 1854 from Luxemburg. 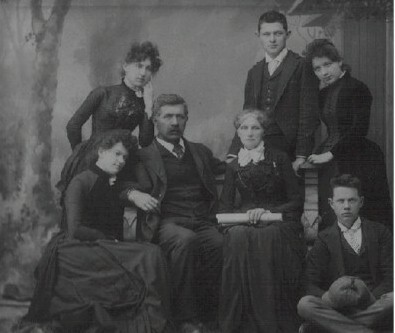 Children of Peter & Margaret Laux. All born in Luxemburg. Charles: 1842- Dec 28, 1914. married Elizabeth Kief. Children: Josephine, James, Mary Aileen, Charles Albert. Nicholas, Peter, Charles and Dominick are brothers. Anna is their sister, and they are all born in Luxemburg. (Note the name is spelled Loux). Nicholas Laux was born in 1834/35 in Luxemburg and came to America in 1854. Nicholas sold his share of the St. Nicholas Hotel in Decatur to his brothers in the 1880's. Family tradition indicates that Nicholas Laux participated in the Oklahoma Land Rush at noon on April 22, 1899. He resided in Guthrie, Oklahoma in the late 1890's. Also following Nicholas to Oklahoma was William Dunn, his nephew. William was the son of William Dunn and Anna Dempsey Dunn. Anna was the sister of Bridget. Thanks to James Burke, Jr for the photo. "Charles Laux, the proprietor of the St. Nick means business as will be seen by an advertisement for bids in the addition to the St. Nick early in the spring, and wants to get the last figures of contractors on the proposed addition. The new Mansard roof top off the hotel in the style and will give the addition of 25 rooms to the house. The improvement will give largely increased facilities for the accommodation of guests. Mr. Laux has a sketch of the completed building as it will appear when the contemplated changes are made, and it will look quite imposing. According to this design an addition of 35 feet is to put on the south of the main building, new balconies to be added and the general appearance of the whole greatly beautified. it is to say that part of these improvements will be made next year, but all may not be finished. it certain however that the genial proprietor of the house will make every effort to provide for that great inn of custom which has for months been the highest compliment that could have put to him as a good landlord." Saturday Herald, December 25, 1880. "Nick Laux is busy at work in preparing the ground floor of two of his buildings on South Main street for an office and dining room of a new hotel, which he will open within about four seeks. The dining room will be 40 x 35 feet in dimensions, and an ample room for a kitchen and wash room behind will be left then. Mr. Laux will put up a new building fronting on Wood street to be used as the entrance to his livery stable. The new hotel will contain about 30 room in all will be finely furnished." "Wednesday, December 22, Peoples Docket. People vs. Thomas Andrews; selling liquor to inebriates: same order with Charles Laux as security." Portrait and Biographical Record. page 551. The St. Nicholas Hotel. The above is a representation of one of the most famous hostelries found within the boundaries of this grand commonwealth. Here the traveler finds rest and comfort, and on the site where the old-style landlord greeted with hearty smile the occasional guest as he alighted from the primitive stage coach or jaded horse, the present popular host, Mr. Charles Laux, meets with open arms the hundreds of commercial men who flock here to participate in the good cheer that each knows awaits him, and sleep in the comfortable beds in airy chambers where every modern convenience is found. For thirty Mr. Laux has been landlord of the St. Nicholas, and his name is always associated with this renowned hostelry. In years gone by, "before the war," the Harrell House was the rendezvous for many remarkable men. Here Abraham Lincoln met and joked with other remarkable men, but little less distinguished. In 1865, Mr. Laux remodeled that hotel and named it the St. Nicholas, which stood till 1891, when the present magnificent edifice was erected at an immense cost and now stands a monument to his enterprise and ability.